Win gold on public transport, or sit in a traffic jam like this. Commuters in Dubai are being offered the chance to win lavish prizes if they take public transport, it's reported. The emirate's transport authority is giving away 4kg (8.8lb) of gold as part of celebrations for Public Transport Day on 1 November, to try and lure people out of their cars and into mass transit, the Gulf News website reports. The prizes will be handed out through "raffle draws and other surprises" over the course of a week, it says. The event is aimed at encouraging people to "shun reliance on private vehicles and switch to using public transport," says Dr Yousuf Al Ali of the Roads and Transport Authority. 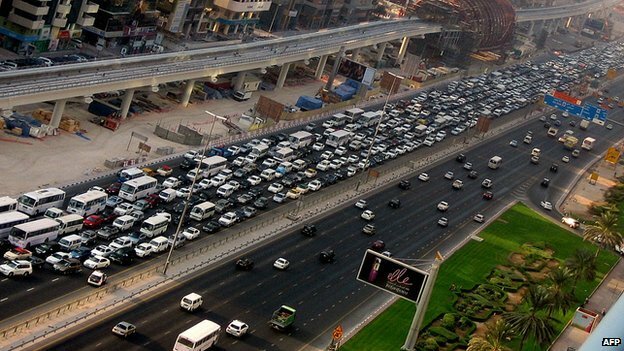 Car ownership rates in Dubai are among the highest in the world, with an average of 2.3 cars per family, Gulf News reported in September, while only 13% of people use public transport. It's not just precious metal up for grabs in the bonanza. In total, prizes worth one million dirham ($272,000; £170,000) will be handed out, including at a street-ball tournament where the first prize is 10,000 dirham ($2,700; £1,700). There's even a celebrity guest; retired basketball star Kareem Abdul Jabbar will be in attendance during a basketball match at a bus station. But only those committed to using public transport are in with a chance, because commuters have to own a Dubai travel card to enter the competitions.